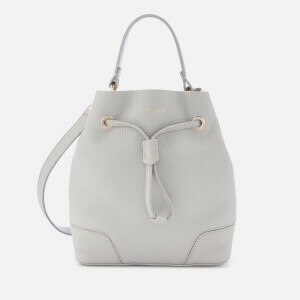 Women’s ‘Hana’ shoulder bag with a distinctive saddle silhouette from See By Chloé. Suspended from two detachable handles, the zip top bag is crafted from grainy leather with soft suede inserts and antiqued gold-tone hardware. A spacious, fabric-lined interior provides secure storage of daily handbag essentials. An external pocket at the front secured with a top flap and magnetic closure offers additional storage. 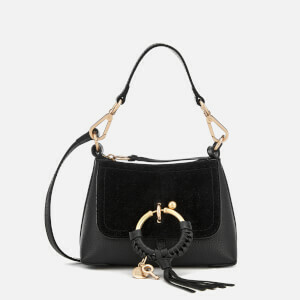 Detailed with the brand’s signature ring embellishment wrapped in woven leather and adorned with hanging metal charms. 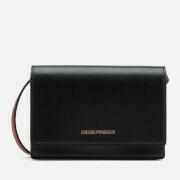 A long, adjustable strap offers cross body wear. Debossed branding at the front. Comes with a protective dust bag. Dimensions: H: 25cm x W: 25cm x D: 5cm. Handle Drop: 21cm. Strap Drop: 52cm.